The Adroit Single Sided Linkage Fork is a configurable Front Subframe and suspension carrier for your enduro rig. 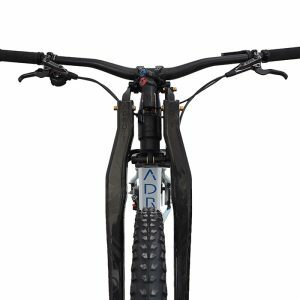 Optimized to take advantage of the current generation rear shocks available in the market, the Adroit Single Sided Linkage Fork features a vertical front axle path during suspension articulation and integrates anti-dive. Designed to be configurable between 140mm and 170mm of suspension travel by switching out the rear shock cartridge, at launch a Fox X2 200×57 rear shock is included for 160mm (161mm actual, 571mm fork length) of smooth Stiction Free travel. A rigid dual crown design also integrates a 32mm length stem into the top crown. A fully optimized shock leverage ratio offers plenty of mid-stroke support while 6803-2RS and 6001-2RS bearings used throughout gives the rider ultimate control; the Adroit Single Sided Linkage Fork effortlessly floats over rock gardens and conquers enduro racing, aggressive trail, and anything in between. Designed and assembled in Portland, OR.